Every day from 09:30h to 10:30h. Saturday it will be from 13:00h-14:00h. 1 Class = 10 Euro, 5 Classes = 40 Euro. Jacobo Rodriguez has been teaching Anusara-Yoga since 2004 and he is an enthusiastic tango-dancer . 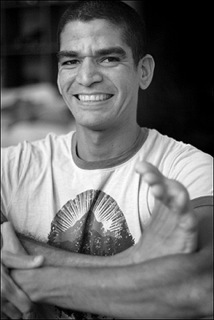 Jacobo studied Yoga with the most internationally renown teachers of our time, and has a broad knowledge of human anatomy, body movement and the application of Yoga techniques for therapeutic purposes. His dynamic, clear and humorful way of teaching makes it possible to learn a lot about the deepness of one’s own body.